Update: My lunch plans fell through the other day, and I was driving around the medical district in search of some good eats. I made a turn down Butler Street and there was Mike Anderson's. I decided to stop in and try a menu item that intrigued me, but I had not yet bothered to order. It's the Sloppy Mike, and it's messy. To build this behemoth, smoked brisket is chopped with onions and jalapenos then mixed with BBQ sauce and hot sauce. This wasn't quite what a very recent flu victim should be ingesting, but I was hungry. I made it a meal with their ultra crispy double fried okra and the BBQ beans with big chunks of sausage mixed in. The bun enveloping the meat was of good quality, and the meat beneath was smoky and spicy. The heat wasn't unbearable, but there was certainly a kick to both the sauce and the meat. I liked the combination of flavors, and the meat wasn't swimming in sauce. 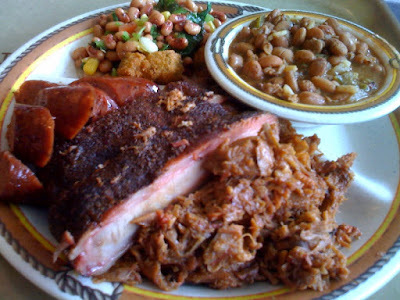 This is just another good option for a quick and reasonable BBQ lunch in Dallas. 2009: I've eaten at this joint a few times in the past without being very impressed. I didn't give it much of a second thought until so many recommendations came in from readers. Then I noticed it in first place on the A-list on WFAA, so I decided to give it another try. This visit came at the height of the lunch rush rather than later in the afternoon as my previous visits were. The place was packed but the line moved along swiftly. Remembering that their brisket had not shined on previous visits, I ordered up a three meat plate with ribs, pulled pork and hot links. Sides are self-service, and everything is homemade. I sampled some okra that was right out of the fryer, and as addictive as popcorn. The black-eyed pea salad tasted fresh with the addition of sweet corn and cilantro, and the kicked up pintos included onions, brisket and some welcome heat. The meat plays second fiddle to the truly outstanding sides, but still holds its own. "Pulled" pork was more chopped, but included bits of tender meat with smoky crust and a restrained amount of sauce to create a balanced flavor profile that still let the meat shine. Meaty ribs had a heavy rub and a bit of smoke flavor. The moist meat was tender but still required a toothful tug to separate from the bone. Hot links from Smokey Denmark had taken on a good level of smoke, and had that familiar peppery flavor with little filler. Not pictured is the brisket. After two mediocre meals, I opted for no brisket when ordering. After enjoying all that was on my plate, I asked the benevolent man with the knife to slice off a few bits of brisket from the crusty end. What I received were robustly smoky morsels of moist tender meat with good overall flavor. After judging this joint at the height of the lunch rush, I was thoroughly impressed. Given that I enjoyed everything that touched my plate, I am compelled to bump up their rating. A sliced brisket plate will be had on my next visit, and I'm looking forward to it. 2008: Service here is cafeteria style with an extensive choice of sides. The brisket was gray and dry with a faint smoke flavor. With little crust and no pink line, it was not surprising that this brisket was roast-beefy. The ribs were better with a nice heavy, dry rub and a good smoky flavor. These monster ribs were tender and moist with well-rendered fat. 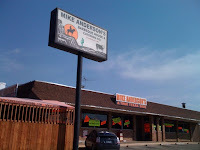 When I worked in West Dallas, this was one of my favorite stops. Its been a few years since I've returned because I work farther away. But I always thought this was an under-rated Dallas BBQ joint. I work at UTSW across Harry Hines a lot, and before my diet, :(, I used to get their Monster Baked Potato with brisket. These are truly monsters that fill the entire plate and are never old or dry. If you love potatoes and BBQ, the price is great and the lines move fast.